Portland attorney Joe Antonelli, the hero of two lackluster legal thrillers (The Prosecution, 1999, etc. ), comes back for thirds in this case of the murdered judges. It’s clear why Buffa kicks off with a long story Joe tells about his most celebrated run-in with the late Calvin Jeffries, since even dead and buried, the baleful presiding circuit court judge makes by far the strongest impression of any member of his familiar cast. Back in the present, Buffa takes his time getting down to the business of Judge Jeffries’s fatal stabbing, taking time out first for Joe’s visit to his former associate Elliott Winston, whose wife Jean left him for the judge after he was confined to a mental hospital. The Portland cops, meantime, have been a lot less dilatory. Acting on an anonymous tip, they’ve arrested homeless ex–psychiatric patient Jacob Whittaker for the killing, and he’s obligingly confessed, given them information only the murderer could have known, and committed suicide an hour after the arrest. It’s all open and shut—until the day two months later when Judge Quincy Griswald, Jeffries’s replacement on the circuit bench, is stabbed to death under eerily similar circumstances, and the cops follow another anonymous tip to the same spot to arrest another homeless man with a bloodstained knife. This time, though, Joe—taking time out from the second-chance romance that’s just fallen onto his lap—takes over the case of the second defendant, even though it looks more and more to him as if the real killer must be a man who’s had an unbreakable alibi for the past 12 years. In the absence of ingenuity, Joe’s only tool is bulldog tenacity. Will it be enough to win? 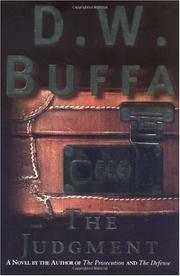 Building his case more through anecdote and apothegm than through evidence or linear narrative, Buffa produces exactly the ending savvy readers will have seen coming all along.